This is an awesome baby sling pattern! I have owned many different types of baby carriers, and the pouch sling is my favorite...and my husband's favorite pieces of baby equipment too. Baby slings are all the rage...even celebrities are sporting these stylish pouch slings. Now, you can save money on baby, and look as stylish as the stars by learning how to make your own baby sling. All you need is some basic sewing skills, and this free baby pattern. I'll show you how, step by step with this illustrated free baby sling pattern for fleece and stretchy fabrics. This style of sling will transition from newborn through toddler stage, as it can be worn as a hip rider sling. I especially love the fleece and stretchy slings, as they don't ever need to be ironed, and stretch with your baby as she grows. 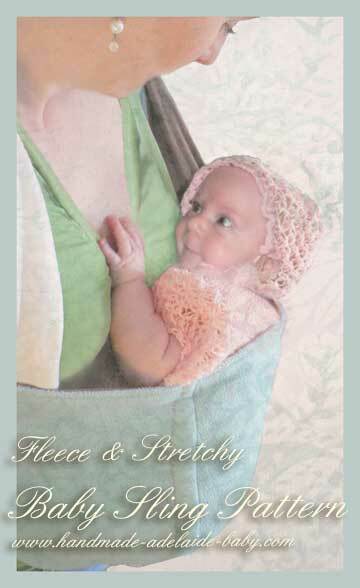 This free baby sling pattern is for stretchy fabrics like fleece and knits. If you're interested in a free baby sling pattern for making a sling with non-stretchy fabric (like regular denim or canvas) please go to this non-stretchy baby sling pattern! If you want to make a reversible sling with one stretchy fabric, and one non-stretchy fabric, then please use the pattern for non-stretchy fabric. New to baby slings? Be sure to stop by the main baby slings pattern page for access to all of the different baby sling patterns, as well as tips on choosing fabric, wearing your sling, and even baby sling safety. Please Note: I offer these patterns as a gift to you, and would like to remind you that your baby's safety is your primary responsibility. Please educate yourself and take every precaution when using these patterns, as they do not come with any guaratees. Click on the Frugal Tips piggie bank icon to find some great ways to save money when you sew a baby sling. My sister Fran shares her top secret, practical ways to save money on fabric and sewing. Now...let's make a baby sling! -Nylon thread, or regular thread in a contrasting or matching color to your fabrics. -Approximately 2 yards of each fabric that you plan on using. *Hand sewing on pouches is not recommended, as the center seam is weight bearing. For baby's safety, it is critical that the center seam be as strong as possible. Please Note: the illustrations in this pattern are not to scale. My aim was to give you a clear idea of the written instructions. If you'd prefer photographic instructions, then please read through the directions for the stretchy fabric first, and then follow along with this photographic baby sling tutorial. Lining your sling: You can line your sling with the same fabric that it is made out of, or use a contrasting color or coordinating pattern. When making a lined sling out of two different stretchy fabrics, keep in mind that the finished sling will only stretch as far as the least stretchy of the two. See some cute fabric combinations, and other fun options you can customize when you make your own baby sling. fleece and a pretty milk chocolate colored silky jersey knit. My husband and I could both wear the sling, and it kept my January baby toasty warm! Wash your fabric (and iron if necessary). Don’t skip this part if your fabric has a high cotton or natural fiber content. It’s very tempting to just dive right in with that beautiful new fabric you’ve just purchased. But your lovely finished sling could shrink in the wash, and become an ugly duckling. Failure to pre-wash and iron can result in a sad and shrunken pouch. Don't ask me how I know this. "Pre-washing and ironing is what makes the difference between ‘It's homemade?’ and ‘Wow! You made this?’ "
If you are making more than one sling in the same size, or lining your sling, you can carefully line up and fold your fabrics together so that you only have to cut once. For a lined sling, carefully line up your fabrics with right sides facing. Then proceed with the rest of the free baby sling pattern directions. Line up and cut through both pieces of fabric as you go. Be sure to keep those edges lined up and neat as you make your cuts and folds. This makes it much easier to sew straight and professional looking seams. Unfold your fabric and lay it out flat on a cutting surface or the floor. First, you’ll be measuring and cutting the fabric so that it is the right width for a sling. This cut will determine how high the sides of the sling are when worn. You'll be making a 22" wide pouch (when unfolded) This allows you to get 2 slings out of a 44” piece of fabric. Or, you can fold the fabric in half (right sides together) and create an instant lining for your sling. If you want to make a self-lined sling, fold your 44" fabric lengthwise down the center with right sides together. Then move on to Laying Fabric out to cut. If you don’t want to self lining your sling, just cut your 44” piece of fabric in half, right along the long center fold line. (fig. 1) If you're using a fabric that is wider than 44", then fold up an 11" flap of fabric along the bottom edge of the entire length of fabric (fig. 2) and cut along the top of the fabric. If you've cut using this method, then don't unfold the fabric, and just proceed to Then Fold in the next section. If you're using a fabric that is wider than 44", then fold up an 11" flap of fabric along the bottom edge of the entire length of fabric (fig. 3) and cut along the top of the fabric. If you've cut using this method, then don't unfold the fabric, and just proceed to Then Fold in the next section. Then fold, matching up the short sides of the fabric, which makes it half as long as it was. Fold it neatly so that the edges are all lined up as best you can. The illustration is shown mid-fold. Your finished, folded piece of fabric will be a plain, boring rectangle like figure 7. It is recommended to take your body measurement for a custom fit. (fig.6) To get your custom measurement, measure across the front of your body from one shoulder to the opposite hip bone, and then add 2” to the body measurement. This is your custom length measurement. The extra length is allowance for the pouch that cradles the babies heiny. Note: Do not add 2" if you are using a measurement from the size chart below. The allowance is already built into those measurements. Choose your size based on what size fitted/knit shirt you wear. This accounts for torso length & girth (or expected post delivery girth) including bust and tummy. It's always best to take an actual measurement instead of relying on an average size, but these are helpful guesstimates if you are making a gift. If you have more questions about sizing, there are some helpful tips on the FAQ page. I highly recommend making your pouch slightly larger than you think you'll need. For one thing, there is the milk issue. Two. If your pouch ends up too big, you can quickly alter it by cutting off the pouch seam and re-stitching it to make it smaller. But if you make it too small, there is no simple solution for making it larger. Using your custom measurement, or an average measurement from size chart above. Measure (as shown in fig. 7) from folded left edge of your fabric, and mark your correct length along the top and bottom edge of the fabric (I like to use a pin to mark my cuts). Cut fabric to the correct length in a straight line from one mark to the other. You may pin the top edges to hold the fabric in place as you cut the pouch in the next step. Note: Since your fabric is folded in half lengthwise, it is actually twice as long as your body measurement. This gives you enough fabric to go all the way around your body when you’re wearing the sling. Another Note: I am cheap, so I slide the top edge of the fabric back to the custom measurement, so that I can save all of the leftover fabric. Place a pin at the bottom right corner. Pin straight down into the carpet or cutting board through all the layers of fabric. Next, you are going to measure and place a pin 3 inches back from the top right corner. Stick the pin straight up, through all the layers of fabric. Move down 1/2 inch and put another pin directly below the top pin. The pin that you've just placed will mark the top edge of the curve. The space between the top marker pin and the one at the top edge will be cut straight, and is your seam or hem allowance. Now we’ll mark out the curve: Use a piece of yarn or string to help you lay out a curve as shown in fig. 8. When you are satisfied with the shape, place pins or draw along the curved string to mark your cutting line. Cut out your curve. If you plan on making more than one sling, then use the sling that you've just cut to make a quick custom pattern. Take the folded sling, and lay it on a piece of heavy paper. A cut and unfolded shopping bag or a heavy piece of wrapping paper work well. Carefully trace around your sling to create a paper pattern. Be sure to label the pattern with the name and measurements of the person who it is made for, as well as the fabric type (stretchy or non-stretchy). Now all you have to do for your next sling is fold the fabric, pin on your free baby sling pattern, and cut it out! It's easy to make modifications when you make your own free baby sling pattern. If your first sling turns out a little too long, or you want the pouch to be deeper, just make notes on your paper pattern, and make the needed adjustments on your next sling. Now you're ready to Sew your Baby Sling!